Pitzer College was named for benefactor, noted philanthropist and orange grower Russell K. Pitzer (1878-1978). Founded in 1963 as the sixth institution of The Claremont Colleges, Pitzer began as a residential liberal arts campus for women with a curricular emphasis in the social and behavioral sciences. Pitzer was the first independent women’s college to open in the United States since Bennington College in 1932. The College began in 1964 with an entering class of 153 students. The founding faculty, students and staff designed Pitzer as an innovative liberal arts institution. The College’s pioneering programs embraced interdisciplinarity in teaching and learning, creative and cooperative classroom experience and community governance, encouraging every voice to be heard equally and fully. Pitzer College received accreditation by the Western Association of Schools and Colleges in 1965. By 1968, the College’s enrollment had grown to some 550 students and in 1970, Pitzer became coeducational with a student population of 618 women and 80 men. Today, Pitzer enrolls approximately 1,000 students in more than 40 fields of study leading to the bachelor of arts degree. Some of the more popular concentrations are psychology, sociology, political studies, media studies, environmental studies and art. In keeping with its distinctive heritage, Pitzer remains dedicated to individual growth while building community. Students are expected to engage in community service learning and the campus is now a leader in sustainability, intercultural understanding and global study and inquiry. Students of ethnically diverse backgrounds come from all parts of the United States, as well as from nearly 20 other countries, to attend Pitzer College. In addition to learning from one another, students are encouraged to participate in one of Pitzer’s study abroad and international programs. Pitzer challenges students to develop a set of courses that will expose and engage them with issues from the perspective of at least two cultures and two disciplines. Students are also invited to take advantage of the many other Claremont resources that enrich and strengthen their appreciation of global diversity. Seven educational institutions now comprise The Claremont Colleges: Pomona College, founded in 1887; Claremont Graduate University, 1925; Scripps College, 1926: Claremont McKenna College, 1946; Harvey Mudd College, 1955; Pitzer College, 1963; and the Keck Graduate Institute for Applied Life Sciences, 1997. From its founding years to the present, Pitzer College has embraced a spirit of inquiry, participation, and adventure that is a hallmark of the Pitzer education. 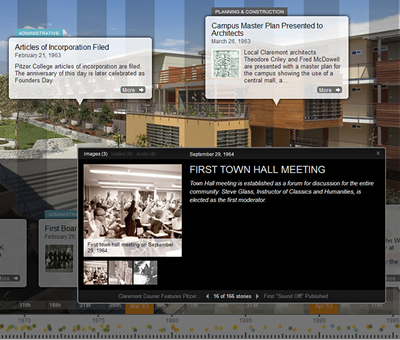 To learn more about Pitzer’s history, view the Pitzer College Archives interactive timeline.